In that interest, let me get one thing out of the way first. I neither care for nor about the politics of either Brie Larson or of anyone who hated on the film before seeing it. I care about the movie, so if you want a discussion about the politics and whatnot on either side, I am afraid you will have to find it elsewhere. I chose to just sit back and relax and enjoy the movie, and I hope you may find yourself able to do the same with this, my little review, on my humble blog. This is the origin of Carol Danvers, who becomes the titular hero and one of the most powerful figures in both the Marvel Cinematic Universe as well as the comics on which such is based. Thing is, it’s one of the longer, more convoluted origins, and, I am borrowing someone else’s words here, it does not start with the hero being an overgrown man-child. As such, it makes sense for them to begin telling Carol’s story technically in the middle, at a point when her own past has been taken from her. As events unfold, that past comes to light, ready for her to reclaim it, and when she does, she doesn’t just magically mature like other heroes have. She was already mature, because she’s been continually knocked down and gotten back up again. This movie just tells the story of how she does it again, in a much more grand and flashy way. As such, she finds that, where she has been fighting to prove herself all this time, now she learns that she really doesn’t have to prove anything to anyone. That’s a bit more intricate than simply maturing. It’s growing and, dare I say it, blossoming. If that sounds a bit fem, my apologies, but it fits. Quick note about that: I love how this movie centered on a female superhero without either making a big deal out of it or having to make men look weak in order to do it. And on that note, I loved how we saw Nick Fury acting in the capacity of an agent, in his days before he became the mighty, conniving Director of Shield. We see him during the experience which inspires him to begin the Avenger Initiative, and he is pretty good at his job. The narrative was also a bit more intricate than many other superhero movies. Not only is Carol’s story told, showing, briefly, everything that made her who she is, but the heroes and villains of the story are not so clear-cut as usual. Even when the supposed villain turns out to have a most worthy cause, he’s not portrayed as being entirely innocent. If I have one particular complaint about Captain Marvel, it’s how Carol’s story has only barely begun. There’s quite a bit more work for her to do, most especially in bringing a reckoning to the alien powers which have done so much harm. We see her rise, and her power, and she even throws down the gauntlet to her enemies, but it feels a bit… unfinished. It’s even a bit lackluster, when she drives the enemy away from Earth, and given the great explosions involved in that, this says something. It loses just a touch of the thrill and suspense, much like when we finally see exactly how Fury lost his eye. This entry was posted in Movies, Tuesday Review and tagged Captain Marvel, Marvel Cinematic Universe. Bookmark the permalink. 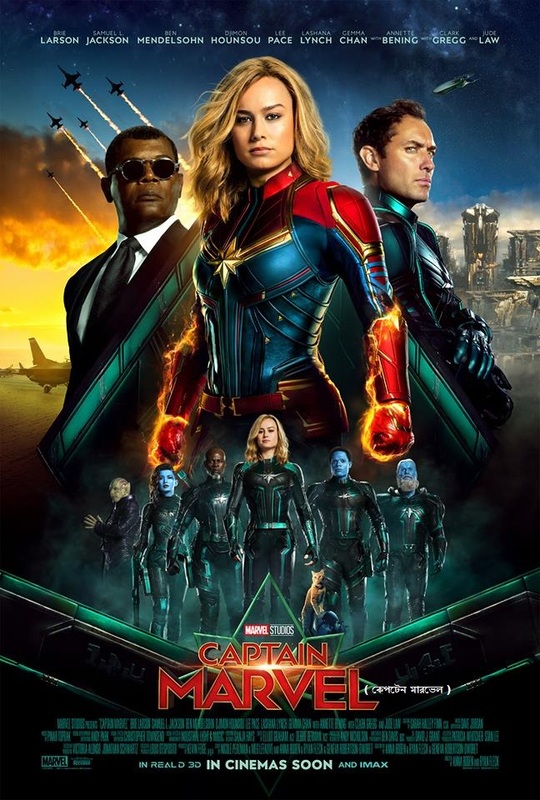 I don’t think that you really can discuss the movie without considering the politics behind it, because it turns out that Brie Larson was right. The movie has an unashamed feminist message which seems to go right over the head of most male (and, to be fair) some female reviewers. But since the messaging is really well-done, everyone can get something out of it. Perhaps, but I find it more distracting than informative. I mean, I heard about Brie Larson’s behavior, and I heard about the behaviors of the haters, and I heard about this one lady who flat-out flipped out and accused this one couple of being sexist, misogynist, etc. just because they weren’t rabidly eager to see the movie the instant it hit theaters but preferred to wait until it was out on DVD or something like that. Heck, I even heard one critique that Captain Marvel made it look like she’s the first female superhero to hit the screen that was disrespectful to the rest of them and blah-blah-blah. Basically… I think it’s all hot air. It’s a superhero movie. It has a female superhero. Said female superhero overcame sexism, yes, but that is the least of what she’s overcome. And in the end it’s not about proving something to a man on his terms, it’s living her life on her own terms, by a completely different set of criteria. That doesn’t sound so feminist to me, at least not by the modern use of the word. Eh…it was the other way around. This story you heard was most likely spread by Anti-SJW who have desperately tried to sink the movie by spreading fake news about it and engineering controversies. Well, they tried, the actual MCU fans mostly just ignored them. No, it goes over your head because most likely nobody every told you to “not be so emotional”, nobody ever gaslighted you into thinking the only way to have a career is to clamp down on who you are in order to fit into a system which was build by men for men, you never desperately tried to get the respect of your male co-workers only to realize that they will never give it to you simply because you are a woman, and that it is actually not worth worrying about it. Belief me, the movie speaks to the female experience, and when Carol stands up again and again and manages to shake off years of gaslighting, it is just incredible empowering. That is not meant to be an attack on you, btw. You didn’t create the system after all. Just be aware that there is a whole meta narrative to the movie which obviously does resonate with the female audience.